The Western barred bandicoot weighs 190 - 250 g (6.8 - 8.9 oz). It formerly occurred over much of southern Australia in semi-arid and arid areas with a variety of vegetation types. In its one remaining habitat, on Bernier and Dorre Islands, it is especially abundant in sandhills behind beaches. It is insectivorous and usually obtains its food by digging. It is mainly nocturnal, usually emerging at dusk. One to three young per litter are born, with two being the most common. The Western barred bandicoot formerly occurred in Australia from Western Australia east through southern South Australia to western New South Wales and northwest Victoria. It was last recorded on the mainland in 1922. As of 1970, since no specimens had been found for many years it was presumed extinct. By 1983, it had been rediscovered on Bernier and Dorre Islands and as of 1996 is only found on those islands. Reasons for its decline have included predation by introduced foxes and feral cats, competition from livestock and introduced rabbits, habitat clearing and degradation, and changed fire regimes. *** The Western barred bandicoot has a backwards-opening pouch, possibly to prevent the pouch from becoming soiled when the bandicoot digs the hollow in which it makes its nest. The Western barred bandicoot formerly occurred in Australia from near Onslow in Western Australia south to near Perth and east through southern South Australia to western New South Wales and northwest Victoria, as well as Bernier and Dorre Islands in Shark Bay, Western Australia. It had disappeared in New South Wales by the 1860's, and it was last recorded on the mainland in Western Australia in 1909 at Onslow and in South Australia at Ooldea in 1922. As of 1970, since no specimens had been found for many years it was presumed extinct. By 1983, it had been rediscovered on Bernier and Dorre Islands and as of 1996 is only found on those islands. 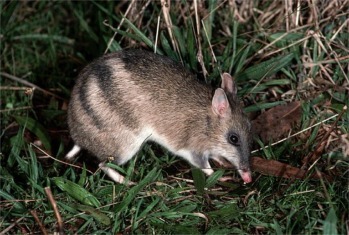 The Western barred bandicoot weighs 190 - 250 g (6.8 - 8.9 oz). The Western barred bandicoot formerly occurred over much of southern Australia in semi-arid and arid areas with a variety of vegetation types. These included plains and sand ridges with woodlands, open saltbush and bluebush plains, desert acacia, stony hills, dense scrub and heath. In its one remaining habitat, on Bernier and Dorre Islands, it is especially abundant in sandhills behind beaches, although it also occurs in grasslands and scrub communities on vegetated dunes, on sandplain, and among travertine outcrops. The Western barred bandicoot is one of the species that live in the Southwest Australia Biodiversity Hotspot (Cons. Intl.) . Mating occurs mainly in the autumn and winter. 1 to 3 young per litter, with 2 being the most common. The Western barred bandicoot is omnivorous, eating insects, seeds, roots, herbs and small animals. It usually obtains its food by digging. The Western barred bandicoot is usually nocturnal, spending the daytime in a nest beneath a low shrub or tussock, although it has occasionally been seen in the daytime. Western barred bandicoots usually occupy a nest alone, although on occasion two animals are found together. It has also been reported that they can become belligerent towards each other.